Today, I want to tackle traveling with a big family. But that’s a really broad topic! So I’m going to focus in a bit. This post isn’t about time on the plane or how to pack or where to go or where to stay. Instead, I’m going to share everything I’ve learned about what the days are like (and how to make them awesome!) once you are at your destination. Sound good? I have lots of tips, so I put them in list form. And I hope as you read them, they’ll remind you of your own tips — which you should totally share in the comments, because I would LOVE to learn from you! Also, as the title declares, yes this is about travel with a big family, because that’s what I know best. But the reality is, most (if not all) of these tips would work for small families, too. So really, this is about travel with kids. 1) When thinking about your day, plan based on the lowest common denominator, meaning the youngest in the group. If you’ve got a little one, they can’t walk all day and they don’t suddenly have new or different schedule needs because they are in a new place. So keep the schedule really simple and be ready for lots of stops. In Rome, we’d take gelato breaks like 5+ times a day. 2) Only put ONE big destination/activity on the schedule each day. That’s it. Only one. “Visit the Van Gogh Museum.” “Go horseback riding.” “Take a city bus tour”. Yes, if it was just grownups, you could pack the day and see a million things. But with kids, it pays to be less ambitious. Keep it simple. If things go wrong, and they often do — maybe you get on the wrong bus, or have a hard time finding a lunch spot, or the weather turns crummy — it won’t wreck your schedule. You’ll feel great that you accomplished your one big thing, and when you’re done, if the family still has lots of energy, you can always add on a bonus activity. 3) On the way to your big event or tourist spot of the day, stop at every park you encounter along the way. Why? Partly because it’s fun and part of seeing what this new place is like. There are so many different kinds of parks, big green spaces, urban asphalt parks, tiny neighborhood play spaces. 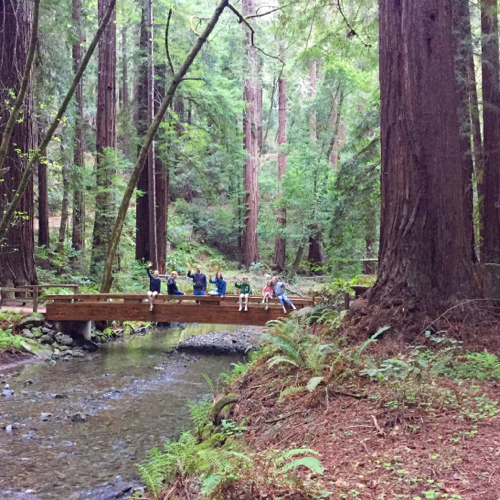 Your littlest kids probably won’t remember the trip, but spending time at parks will make sure they have a wonderful day, and that helps the whole group. It’s also a way of losing time, or of filling the day in a positive way, without stressing anyone with a packed schedule. 4) Bring water. It should be the only heavy thing in your pack. If you don’t want to carry it, know where your water sources are quickly and easily. Having clean water on hand is essential. First, for thirst, but also for rinsing scrapes and cleaning off sticky hands. 5) Instead of packing them ahead of time, buy snacks in local grocery stores. It’s a small adventure in the larger day. Use it as an opportunity to explore a non-touristy piece of the place you’re visiting. There’s nothing like going to a grocery store — especially in another country — to give you a glimpse of what it would be like to live there. What do their milk bottles look like? Do they refrigerate the eggs? How are the fruit and vegetables packaged and sold? Any new veggies you’ve never seen? What does the toothpaste look like? Is it a huge supermarket or a tiny corner grocery? Any familiar brands? Maybe with different flavors/products than you have at home? How about the candy aisle? 6) Even if you’re past the diaper stage, always carry a package of wet wipes. They come in so handy! They can wipe down a table at a restaurant, and they can wipe down a bottom when the public restroom is out of TP. You already know how awesome they are. 7) As you wander and explore for the day, only carry one day bag for the whole family. Make it a backpack, so that you can keep hands free. And pack light — only the essentials for that day or that outing. I mentioned water and wipes, and we also carry sunscreen, sunglasses, and a tiny pouch with Advil and a few bandaids. Sometimes we’ll add a small guidebook or map. During diaper days we would add a few diapers and a spare romper. Try to leave it mostly empty so you can throw in stuff throughout the day — like your toddler’s jacket when he gets too hot, or maybe a souvenir. If there’s only one bag, and it’s light, everyone (or at least the big kids and grown ups) can take a turn carrying it and no one will get worn out. 8) For breakfast, know what you’re going to eat the night before. Have cereal and milk, or pastries, or yogurt ready to go. Or if your hotel includes breakfast, eat that. Knowing what breakfast is ahead of time relieves pressure in the morning when everyone is getting ready and might be cranky from hunger. And if there’s a change of plans — sick kids, rainy day — you’ll know that at least everyone can eat something while you figure out plan B. 9) For lunch, an impromptu picnic is our go-to. If you see a farmers market, use it. Buy carrots or snap peas, a loaf of crusty break, whatever fruit looks good. If you have a pocket knife on you, maybe you can add a small block of cheese. Eat your picnic at the nearest table or green space. You can also do this same meal with items from any grocery store. Think easy open — a jar of pickles, a can of olives with a pop top — and don’t forget to buy a small package of napkins. 10) For restaurants, go during off hours, so the place will be mostly empty and it will be easy to sit your big group. When everyone is finished eating, have one adult take the kids outside, while the other adult pays. I don’t know what it is, but those last 10 minutes while waiting for the check is when things often fall apart. So skip that scene, and get the kids out of there. 11) As you plan your day remember this is what you’re up against: The kids are going to get hungry, tired, bored, too hot or too cold. So you need to plan for those moments, or plan around them. 12) At art museums, start in the gift shop, have each child pick out a favorite postcard from the collection, then make it an adventure finding the original in the museum. 13) Depending on location, size of family, and age of older kids, it’s often best to skip the stroller. We found this to be especially true throughout much of Europe, and at National Parks too. Too many stairs. Too many cobblestones. Not enough space on the public transit. No where to stash it during a tour. Use an on-body baby carrier or sling instead. Or, if you have older kids, you can even skip that and everyone can just take turns holding the baby. In France, there were five of us who could carry baby June. No stroller necessary. 14) Every time you see a restroom sign, point it out to the whole group and take a moment to asses if anyone needs the potty. You’ll see signs in parks, at restaurants, at museums and tourist spots. Even if you’re tired and want to get out of there, take a moment and do a potty check. Emergency restroom searches are a nightmare. Oh. And make sure everyone has used the bathroom before you set out on your daily adventure in the first place. 15) Remember, going through the day in a new city or place IS the adventure. I mentioned putting only one big event per day on the schedule, and that’s because all the stuff leading up to and around that event are also activities. Navigating with a city map is an activity. Eating is an activity. Walking somewhere and taking photos is an activity. Getting lost is an activity. 16) Put on your adaptability hat. Things happen. Traveling can be frustrating. So make a good plan, but be willing to adapt in a snap. 17) Remember: SEEING and BEING in the new place is the goal. Traveling means a break from your normal schedule and routine. It means a fresh view for tired eyes. If you do nothing but just be there — in a park, or on a bench, or on an aimless walk — that’s still traveling and it’s still wonderful. So even if you thought you would do twice as much as you actually end up doing, no stress. It was still worth it, I promise! 18) One of our favorite traditions: Recap on the way home. Someone be the scribe and write notes, while everyone calls out highlights from the trip. Okay. Now it’s your turn! What would you add to this list? And since every family is different, is there anything you disagree with? What works best for your family travel-wise? Chime in! Love love love. One of 8 and I have 5 so many good notes. A bit funny that in tip #14 there is a bit of a spelling slip regarding the potty…ha! I don’t that was a slip, I think that was a pun. Ha! These tips are great! Before our daughter was born, my husband and my travel intineries were jam-packed! 2-3 days in each location, a list of sites to check-off, then hop of a train to the next destination. It was fun for us as a ouple and we had a chance to visit many places, but with a child… Eh. So, we have whole-heartedly embraced slow-travel! This summer we will spend 3 weeks in Paris. Just Paris. We are looking forward to exploring the city in depth. As you said, it is just being somewhere different that is the adventure! 3) Make sure everyone has a good place to sleep that ensures a solid night’s rest. It’s tempting to just pack sleeping bags and figure that “kids are adaptable, they can sleep on the floor in just the sleeping bag” but I’ve learned the hard way that the days are SO much more pleasant if everyone actually has their own bed/comfy sleeping pads/whatever! I’m willing to spend more money upfront to guarantee that I won’t have cranky kids during the day. 5) Look for cool opportunities to build in things you know your kids will love just because they’re kids. A few weeks ago we were in Chicago and decided to take Metra rather than our car. 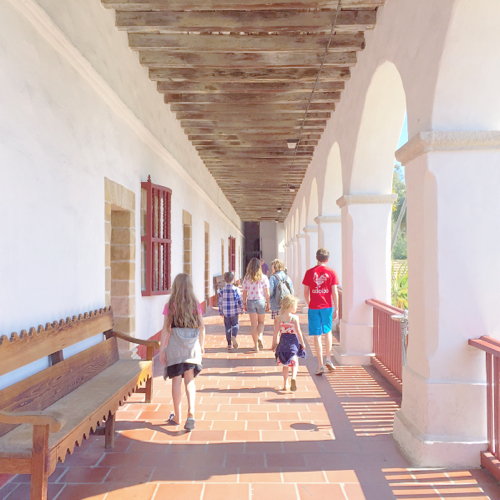 It was slightly less convenient and actually cost more than parking fees, but it was hands-down the part of the trip that my kids loved the best over EVERYTHING else that we did and saw! We are just starting to explore this as we have a 1.5 year old and it’s our first kid. She’s just now at an age where she would enjoy doing little activities when travelling but still I worry about all the things that can go wrong when far from home. That sounds kinda bad, I’m not typically a huge worrier at all! Also how do you handle naps?? Especially with no stroller. Robin I went to reassure you and realized your comment is from 2 years ago! Not applicable for you but maybe for the next person scouring the comments: I have a 19 month old and were doing 2 weeks in London next month- I’ve been having her take her naps in our Scout (it’s similar to an ergo) on my back to get her used to it. She actually sleeps longer and better because of the warmth and movement I think! Love all the tips!!! We just went on a big trip last month and I finally took tip #2 to heart, scheduling only 1 big thing for the day and making sure we did that early enough in the day that it actually would happen (morning if possible). Then I had a whole list of fun things we could do in the same area as that 1 big activity so we could pick and choose as time/mood allowed but we always did our big exciting thing and have the memories to prove it. We took a cue from the kids in NYC when we lived in CT, and started traveling with scooters for our kids. We liked seeing the cities of the NorthEast and Eastern Canada by doing lots of walking, and this allowed my 4 and 6 year old to keep up. We would still bring a stroller (I loved my online Phil and Teds for ease of navigating busy city streets), and if the 4 year old got tired he could take a ride while the baby was in the carrier. This made traveling with my crew of 4 small little people much easier, especially on our urban road trip adventures. The Joovy Caboose stroller is great for that too! I’ve never thought of taking the kids’ scooters with us when we travel. My two big kids scoot everywhere at home and I’m sure they’d love to ride their scooters on vacation too. Not only would it speed them up a little, it would be more fun too! Of course, my 2 year old would want to ride her scooter too and that would slow us back down again! I should also add that part of the beauty of having a Razor scooter is that you can easily fold them up and stash them in the bottom of the stroller (or in a back pack) when you are in a museum or store. We travel) is nothing like the playgrounds we are used to in suburban Phoenix. That’s always exciting! Thanks for so many good ideas – and I wholeheartedly agree with the “be local” ideas of visiting parks, grocery stores, etc. Another fun one in that vein is to always mail a postcard from the local post office. We went inside the most amazing tiny old-fashioned one in Maine a few years ago! So fun. – for national parks trips, do the Junior Ranger program (free booklet for each kid, at any ranger station or visitor center), even if you don’t complete it. Also, most of the NP have booklets geared to different ages. For outdoorsy trips in general, invest in small binoculars for each kid- our kids love them; totally worth ten bucks ahead of time. – AAA tourbooks always seem to have interesting tidbits and recommend sites that I don’t find in other research materials or online – plus info on “free kid stuff.” If you aren’t an AAA member but travel at least once a year, this might be a reason to join? AAA now has ebook versions also – all free w membership + free maps! Junior ranger badges also make great souvenirs. And don’t forget your National Park passport book! A stamp at the parks makes a great memory. Kids can take turns stamping the book, or everyone can stamp at each location. My two big girls love doing the Junior Ranger programs when we visit National Parks. The badges make great souvenirs – especially if they’re only of the nicer wooden badges (like from Muir Woods and Zion). My kids also have the National Parks stamp books and they collect stamps at each park we visit. We also collect one Christmas ornament from each place we visit. Nothing on our Christmas tree matches but I love that each ornament reminds us of a special place that we’ve visited. The other thing that we always collect when we travel (or visit a new museum etc near home) is squished pennies! My kids love collecting them and they’re a pretty cheap souvenir that takes up almost no space. We do Christmas ornaments and refrigerator magnets. Easy to pack, not too expensive. I love putting the newest ornaments on the tree each year and remembering (or trying to remember!) past trips when we unpack the others. I love the idea of documenting the vacation on the way home – brilliant. I find if we stay somewhere that has either a pool or play area such as a basketball court or a park nearby, it is much easier on everyone. We also love to vacation with friends or family for part of the trip, if it is a close destination. It keeps everyone happier. We have a phrase that comes from a development day my husband did at work. It’s total corporate speak but we ask each other, ‘what’s our win?’ Basically, what’s the one achievement that means you ‘win’ that day. On holidays and family outings, our win is invariably that we were kind and cheerful, at least as parents which makes it more likely the kids are too. I like the idea of only having one activity or destination in the day’s plan but even more for us, when we remind each other with ‘what’s our win?’ it helps to refocus our attitude if we’re getting impatient or tired etc and reminds us the aim is not to see ten famous paintings or to make it to the end of a bush walk, the aim is simply happy family time. I think that’s the idea behind this whole list, but for us, it’s been really useful to make it explicit. Ha I love that phrase! The only thing I would like to ad: Bring a Swiss army knive. Did you know they standard version not only includes a bottle opener, but a can opener and a screw driver, too? Especially the last one can come in handy with little ones exploring the hotel room a little too thoroughly ;-). – Favorite souvenir: flattened pennies! $.51 and you get it beautiful shadow box full of treasures when you get home. – Don’t forget to pack chargers in your backpack. Just in case you need your phone to navigate and take pictures, you can always find a plug somewhere. – Bookstores are also great destinations. Especially children’s book stores! Yes! Flattened pennies are the best for our kids (and hubby – he’s the one that started it). We love them. I wish more places offered them though. And don’t forget to download the Penny Tracker app onto your phone so you know where to find those penny squishers! These are great, and mimic a lot of what we do when traveling with our 2 young boys. I LOVE #17–I can get carried away trying to pack in lots of sights and activities, but with a 3 and (newly) 6 year old that’s the quickest way to tired, cranky kids. We also find that recapping is a wonderful way to make memories and create both energy and reflection for the journey. The tip about getting a postcard and then seeking the art is brilliant! I never would have thought of this, and it also totally made me laugh. These tips were all so amazing! 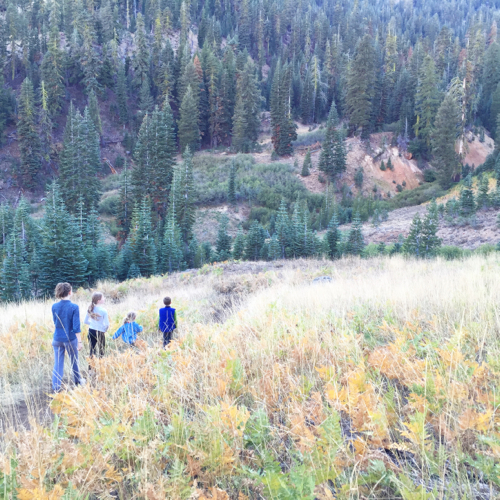 We’re terrible at being adventurous and taking fun trips as a family, (my husband says we’ll get more fun when he finishes his MBA next year)… But it’s good to have all these things in the back of my mind now. I’m definitely pinning this for later. If we go out to eat, we prefer to go for lunch since it’s generally cheaper, less crowded and more leisurely (no bed times to get to). It can also break up a full day. 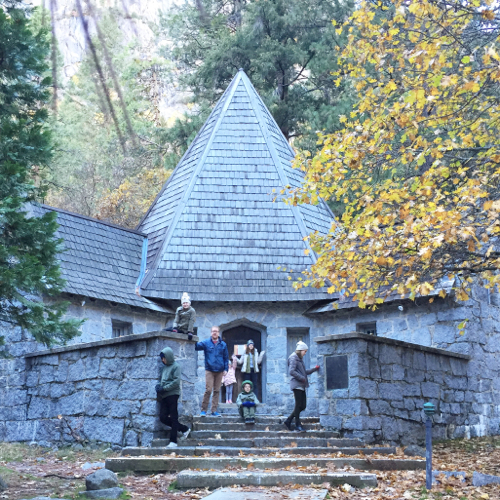 I remember taking 5 kids 6 and younger to Yosemite and my husband getting frustrated that the kids were more interested in the snack than the view. We have learned to let them enjoy the snack and THEN point out the view. Order of operations matters. Dad and Mom may be able to go all day on fumes but kids require fuel (truth be told, so does mom). We have found it very helpful to have ideas of places we may want to eat at beforehand. I am one who likes to look up restaurants and read reviews or talk to others that have been there to see if it may be a good fit. We are rarely dissapointed if we know what to expect beforehand. Having a good idea of where restaurants/farmers markets are located and how far they will be from where you are at is key. Having kids that range from 5 to teenager, there is nothing worse than trying to find (and agree on) a place to eat when everyone is hangry. We love trying new foods, but I always bring a few packs of instant oatmeal with me. It’s a lifesaver because it is quick, easy and can be made anywhere. This is especially handy when travelling overseas and you don’t know what will be available. I agree, ice cream stops make it all more manageable! We’ve done the lowest denominator thing, but we also do quite a bit of splitting up if that’s better. My husband and oldest daughter walked the entire Louvre while I took the younger kids back to watch Ratatouille on the ipad after we saw just the Mona Lisa. Everyone’s happier if we’re not worn out. If it’s a longer trip, we also try to plan out things that interest our various people–if we’re stopping at ancestral cemeteries for Mom, we have to balance that with a zoo for our youngest or all go to a movie (going to a movie in a foreign country is definitely an adventure! )–love it when each family member gets to do something that’s their favorite. 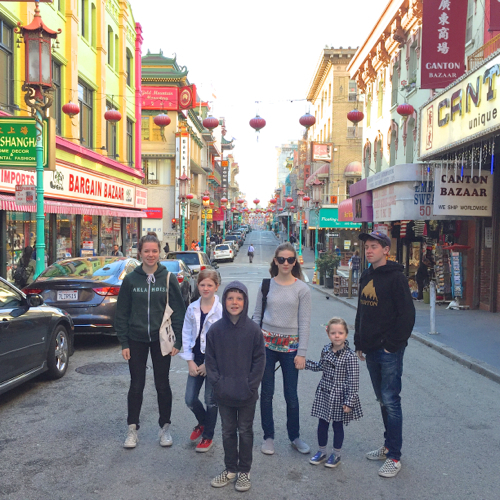 One of my kids really wanted to see what pet stores and dollar stores were like in foreign countries, and exploring those has been intriguing–normal life in a different way. Great tips! The only thing I can think of is the idea of leaving the youngest at grandma’s. I hadn’t really thought of this as a travel option, but when we went to Hawaii a couple of years ago, my husband suggested leaving the 2 year old with the grandparents. It worked out so well for us- our older two (5 and 7) didn’t need naps/diapers/entertaining, and everything was a little easier from flight to day to day activities. The other option was just my husband and I, or not go on the trip for a couple more years. We talk about that trip all the time, and I am so glad we went and had such a great time- and we plan to go again in a few years and we can all go! I’d like to add considering renting an apartment, airbnb, or something with a kitchen. Extra points if the airbnb has a backyard to play in and/or a hot tub to soak in. Even small apartments have more room than a hotel rooms. Not only does the kitchen take care of the breakfast thing (which I totally agree with!) it also allows for a dinner or two “in.” I love eating out and trying new restaraunts but after especially busy days, or days when you go over budget, a simple meal in is the best. And if they have a backyard grill that’s especially great in the summer. That said kids LOVE hotels with pools and room service so if it’s a long trip we;ll schedule 1 or 2 nights at a hotel but never the whole trip. Such wonderful tips in the post and comments! You all make me wish I had a few more kids. But we’re grateful for the one we got. :) We used to travel with my husband for his work and be in the same hotel room for 2-3 weeks at a time. We would pack his 2-man tent & an air mattress with us and let our kiddo camp out in there in our hotel room. We would put the door to the wall with a little walkway and the back of the tent towards our bed. This was great because it gave us adults a lot more privacy, made it a little easier to get kiddo to go to sleep when we were still up, and she felt like she had her own space – and all her toys, blankets, etc. could be tucked out of sight in there. It was nice for her to have somewhere to go for alone/quiet time too. I would often pick up a couple of 10-packs of glow in the dark bracelets from the dollar store and let kiddo link them together to make chains to decorate the inside of the tent. Since it was an easy-up tent, if we needed to fold it up during the day we could do that too. I loved the tips, and the comments are rich with good ideas as well! 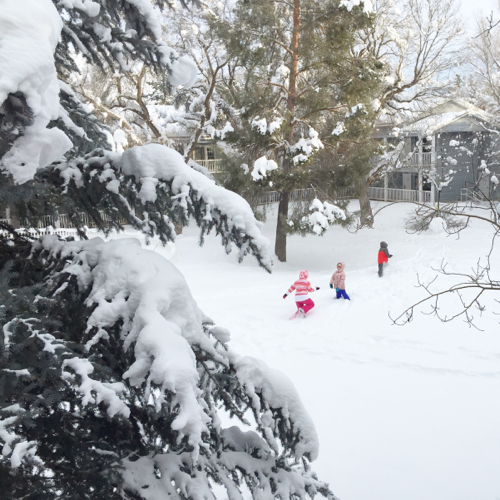 With our six, I agree about keeping people well fed, and letting the kids do age appropriate things that they really want to do without dragging the Littles into things they won’t enjoy (or let anyone else enjoy!). I also like to choose a special read aloud book for evening reading. This really depends on your accommodations and the age of your kids, but on trips that are a little longer – 1-3 weeks – having a book that you read entirely on the trip is another way to create a specific association everyone will remember. We love the Adventures in Odyssey audio drama Cd’s for car trips, and going out for ice cream. 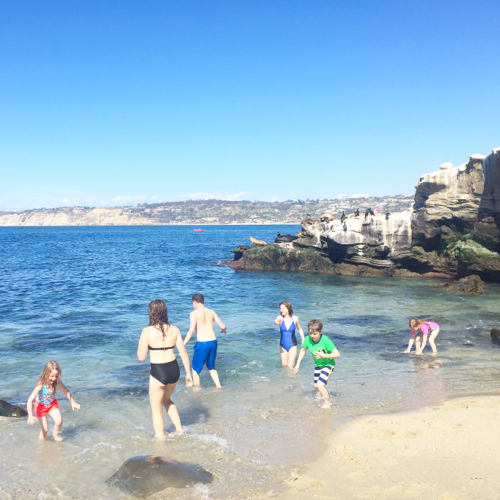 Any silly, random thing that lets your kids know things are out of the ordinary and you all are in vacation mode can help to make good memories and make it feel like an adventure. – Before you leave on your trip, buy your favorite frozen/canned/boxed dinner (chicken potstickers from Trader Joe’s here, or fancy dried pasta and a favorite sauce) and have it waiting for you. Nothing worse than arriving home after a long trip of spending too much money/eating too much greasy food, and having to wait for takeout or run out to the store! – Packing cubes! Each kid/parent gets one. – I always bring a tupperware container – a few leftovers make a great snack, and it’s easier for a toddler to eat from a container at a picnic. I like them all! The wipes. #12. One bag. Water. Stop at every park. Recall at day’s end. I’d add: bring a disposable camera. It’s not too precious. You won’t get caught up in the screen. You can convert film to digital. Great post!! Recently took a road trip. Northern WI to Florida. I discovered and LOVe Bago for luggage. Minimal use of space and kept our family of 7 organized and fold down for easy storage at home. Also a potty bucket for little ones emergency. Ice cream bucket with clumping kitty litter in bags. Layered so you can remove top bag and dispose. We also loved renting a house instead of multiple hotel rooms. We also use a single family bag for outings and picnic lunch. I also like camelback filtered water bottle. You can fill as needed and not have to haul as much water for a family. At restaurants we like to order “family style” maybe 4 entrees for the 7 of us to share. You get to sample more, costs less, less or no wasted food. Farmers markets, depending on where you are in the world, tend to be wonderful stops where there is fresh food, perhaps prepared food and possibly children’s activities. Plan less and relax more – it’s actually supposed to be a holiday for everyone and giving kids a chance for down time outdoors or unstructured playtime is key. You can do some deep belly breathing anywhere in the world to wind down! When you are stressed by an agenda, they get stressed too with push back behavior rearing its head. I pack a very small vial of pure lavender essential oil (at all times in my purse) as great natural anti microbial, headache eliminator and anti nausea smell, and a few drops can go into bath water or on a pillow for sweet dreaming. Be flexible with your plans and be prepared to let go of a fixed schedule – maybe a playground and coffee shop is the right thing to do that day, even if you do that a lot at home! Count your blessings for the luxury of time spent with your gorgeous children and family. Have a mantra – Ex., I am ok in this very moment and the world surrounds me with love. I haven’t had a chance to read all the comments so I’m not sure if I’m duplicating, but we try to “start hard and finish easy.” So if there is a “harder” activity for kids (e.g., a trip to a museum, say) we’d do that early on in the vacation when energy and enthusiasm levels are higher. Then later in the trip we have “easier” activities that will appeal to everyone (or will appeal more to kids than grown-ups). Love this. I’m from a family of 8 kinds and have to say, #14 could not be more spot on! It sure is a challenge traveling in such a pack, but traveling any other way seems so strange to me. Enjoy your future travels! 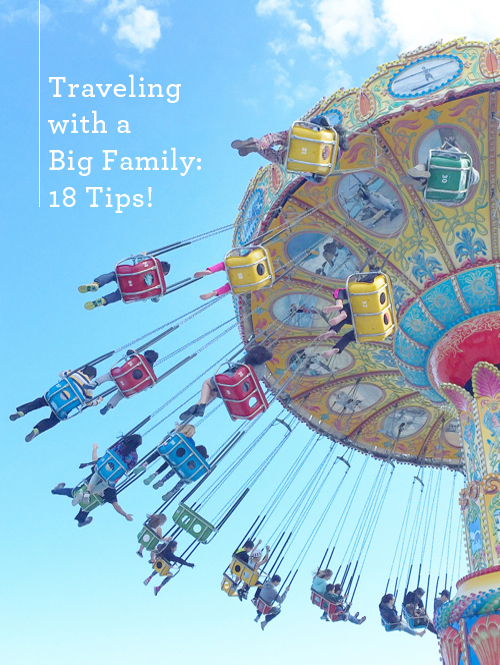 Great tips– I love traveling with kids– everything is even more new and exciting through their eyes. Amazing blog with great information! Thanks dear for sharing. I am really glad to find such helpful blog! Actually, we are planning a family vacation after this new year. Thanks for your tips.By the way, Wishing you a very New Year 2017! Interesting and amazing blog article! You know There are so many bloggers who don’t put any personality into their posts. Love the tips Gabrielle! Travelling with a big family sometimes is very confusing. I really agree on going to restaurants during off hours, we always do that! We eat lunch like 1:30pm and the place is empty, so the service is really fast! Also always charge your phone to 100% before leaving the hotel, it will be also good to download some gps tracking apps and install it to all of your gadgets, just incase anyone in the family member goes missing. Thanks for the tips! This is a very good list! My husband and I have seven children and traveled a lot with them. In our experience, we like to build in “down” days, where we take a day off from sight-seeing and just hang out at the pool or beach wherever we are staying (condo, villa, bnb, rental house, hotel). In advance, we research tour books and guides to find kid-friendly things to do and see. A word about eating during the off times: in Italy, we found that most of the restaurants consider this their “off” time too and are closed, so make sure you have a back-up! The “re cap” tip is pure money! As a group family members see and hear or experience things differently. I don’t know how many times I have heard or said “I missed that!” or “Really, I didn’t see that.” Great idea. I’m glad someone mentioned sending post cards from the places you visit…in this digital age, it is easier to have the addresses of loved ones saved on a device! Hi Gabrielle, great article, and useful comments too! The only thing I would add – after 7 weeks in Europe this summer with 5 teenagers during a massive heatwave: always have swim gear with you. We swam every day, and it really made the 40+ temperatures bearable. Second thing was, each child and adult had a spare battery for their phone. It was a major inconvenience when someone forgot theirs, as modern travel means using navigation, posting on social media etc. All of the phones and batteries were charged each night, so the kids were prepared to do research on our destinations (and check the weather!). It also let us relatively easily let the kids have some independence, which was necessary from time to time for everyone! (The best bonding experience of he trip was when an older brother found a lost sister in Venice!). I really enjoyed this article. Now that my youngest if five, we’re finally getting the confidence to travel more with the entire crew (I have five total). Just trying to absorb as much information as I can get to do it more effectively both for cost and for fun. Loved the tips!